I recently installed Arch on an old PC dedicated for mostly using Samba and Deluge. I am having trouble with Samba. Everytime I transfert files from that PC the transfert stops because the PC crash. All I can do is reset the physical machine. The crash is very random, I transfer 5 files in one action. They are around 2Gb each. The PC with the samba server can crash while the 1st file or the 26th file (because I do it multiple time). I believe the hardware is not at fault. I made some memory tests and everything seems fine. I had, and still have, Windows 7 on an other hard drive. Windows 7 seems to never crash when I transfert files as a host. I read about microcode. Installed it and added it in grub. Testing microcode gives me nothing compared to what is recommended here: https://wiki.archlinux.org/index.php/mi … ed_on_boot Would it be normal ? I found this link on Ubuntu https://askubuntu.com/questions/761706/ … -hH2C0Oxvc that seem to be a similar problem to me, but the first solution seems to use an Intel kernel parameter. I doubt it would work in my case. If you have any suggestion on what could help me find the problem would be very appreciated. Also https://bbs.archlinux.org/viewtopic.php … 9#p1801619 - though this will usually not result in freezes. I had not used the computer for a while and sometimes the crash just does not happen. For the dmesg, I ran it from ssh and pasted it in a file after the crash. I believe it should be enough. Again, if you would need anything else, just ask. Thanks again for your time ! Unfortunately there is not output from the kernel indicating it has detected any issues before the system is rebooted. Feb 03 11:49:39 bonhomme-server systemd: Reached target Graphical Interface. Is this a headless server and do you determine "crash" by "no more network responses"? There's a suspicious "pattern" in the log, you get an IPv6 address and the interface immediately loses the carrier. If not, what is the graphical target? Yeah, I used the computer as a headless server. Except a power cord and a RJ45 cable, nothing is plugged. Huh... I know it sounds crazy but you made me realized something. When I start the computer with a VGA monitor directly plugged into the motherboard, the computer seems to never crash. I wanted to be sure if the screen freezes or not when the computer crashes. When I start without a monitor, the computer crashes after transferring some files. If there is already a usb keyboard, Ctrl+Alt+Del does not reboot the computer. If I plug a monitor after the crash. I cannot see anything. So I assume the computer is "dead" even if the fans and such spin. Maybe my motherboard is old and defective. Odd indeed. What is the graphical.target? By graphical.target, do you mean this config file ? I added what you suggested me to grub. Unfortunately, it does not seem to fix the crash. It happened again 2, 3 times. Where did you find the existance of these kernel's parameters by the way (radeon.dpm, radeon.aspm, radeon.runpm, radeon.bapm) ? They are not on the doc over here: https://www.kernel.org/doc/Documentatio … meters.txt . The crucial bit is whether this is indeed strictlyrelated to the presence of an output (vga monitor) - that seems nuts, but if it was, we'd have to follow that lead and if it's not, you could live-monitor the console messages for some better indication of why the system crashes on transfers. Other things to check would be to kill the torrent client and check file transfers via NFS or FTP rather than SMB. Oh, then I simply use the bash terminal. I did not install any DM, Xorg and such. I only wanted my computer accessible via SSH. I tried FTP from Arch to Windows 10. The crash still happens. May be the crash comes from the kernel's network drivers and my hardware insted of samba ? The deluge's package is installed, but the services are not running. So it does not interfere. I made extra tests. Debian (with XFCE installed at the installation) and Ubuntu Server does exactly the same thing. So like you said, it kind have no choice to come from the kernel. I tried again Windows 7. Because I never tried it without a monitor. The crash never happens. I installed Cygwin/Openssh and deluge. It kind of does what I originally tried to do. If you have other suggestions, I'll be very open to hear them ! Can you use another interface (eg. a wifi dongle or pci ethernet card)? It worked with an old Broadcom wireless PCI device. The transfert was very slow, but, I did not experienced any crash ! For the r8168, it also seems to work. I haven't seen a crash since ! This is so great ! The only (new) problem that I have is: the transfert is slow when a client "uses linux". I tried to get a file from Arch Linux, Windows 10 and a Nvidia Shield. From the Nvidia Shield and an other Arch Linux, the transfert top ~2Mbs/s. I tried to change the link status with this doc here: https://github.com/mtorromeo/r8168 But nothing seems to change. Yeah, I unplugged the RJ45 cable from the server to my girlfriend's laptop (Windows 10). From my main Arch Linux and my Nvidia Shield the speed is back to 12MiB/s. Just like when I used the "original" r8169 on the server. Since I switch to the r8168 driver on the server. The server throttles linux clients or the linux clients are limited by the server's driver. I looked about the 802.11g, it is funny because the first link on google showed my router. I have an WRT54G. By 802.11g, you mean wireless right ? It can't be because I removed the wireless device from the computer. 1. Does the shield have a wired connection? 2. You mean the low throughput only exists while the Windows 10 system is also connected (and raises to "normal" w/o)? Here, I made this table to make it simpler. The "server" is one PC. I swap from a SSD to a HD when I want to test Windows 7. I put back the SSD to have linux again. 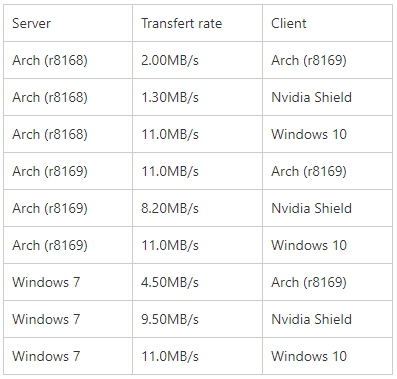 The client (Arch and Windows 10) is one another PC. I dual boot because I plan to keep both of them. I made the average but myself, just by looking the transfert rate. So no fancy testing. So yeah... Using the r8168 drivers slow down everything that is not windows 10. Output of "ip link" and "ethtool <device>" (enp123s0 or whatever it is on your site) with 8168 and 8169? Is btw. "lsmod | grep mii" loaded on r8168?